Introduction Nursing homes and home care face challenges across different countries as people are living longer, often with chronic conditions. There is a lack of knowledge regarding implementation and impact of quality and safety interventions as most research evidence so far is generated in hospitals. Additionally, there is a lack of effective leadership tools for quality and safety improvement work in this context. Methods and analysis The aim of the 'Improving Quality and Safety in Primary Care-Implementing a Leadership Intervention in Nursing Homes and Homecare' (SAFE-LEAD) study is to develop and evaluate a research-based leadership guide for managers to increase quality and safety competence. 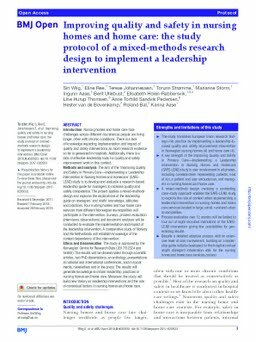 The project applies a mixed-methods design and explores the implications of the leadership guide on managers' and staffs' knowledge, attitudes and practices. Four nursing homes and four home care services from different Norwegian municipalities will participate in the intervention. Surveys, process evaluation (interviews, observations) and document analyses will be conducted to evaluate the implementation and impact of the leadership intervention. A comparative study of Norway and the Netherlands will establish knowledge of the context dependency of the intervention. Ethics and dissemination The study is approved by the Norwegian Centre for Research Data (2017/52324 and 54855). The results will be disseminated through scientific articles, two PhD dissertations, an anthology, presentations at national and international conferences, and in social media, newsletters and in the press. The results will generate knowledge to inform leadership practices in nursing homes and home care. Moreover, the study will build new theory on leadership interventions and the role of contextual factors in nursing homes and home care.